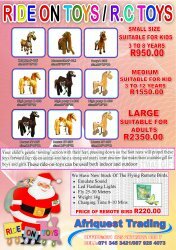 Ride On Toys suitable for all ages.. Its a great gift for boys and girls.. These toys can be used both indoor and outdoor !! Battery operated children's toy ride on. R200 delivery fee in Durban and South Coast areas.